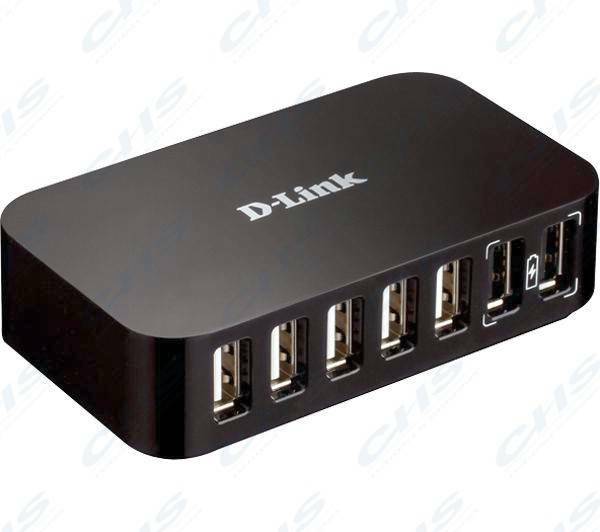 This 7-port USB 2.0 Hub adds additional USB ports to your computer to connect printers, mice, camcorders and USB Hard Drives simultaneously. It comes with its own power supply to provide power to connected USB devices, and is backward compatible with USB 1.1 standard.This 7-port USB 2.0 Hub can provide power to connected USB devices (like USB Hard Drives) by means of the included power supply. This feature makes the DUB-H7 a truly portable solution.This device features two Fast-Charge ports that are designed to feed an increased charging current of 1.2 A to connected devices, when the hub is in Fast Charge Mode. This makes it perfect for charging power-hungry mobile devices like the iPad, as these devices have high-capacity batteries that require higher charging currents to recharge quickly and effectively.If you have an iPad, you know that you can synchronize it with your computer when connected to a USB port, but it cannot be charged at the same time. The DUB-H7 comes with a Windows app (downloadable from www.dlink.eu) to allow you charge and synchronize your iPad with your computer simultaneously. Now you don't need to carry your iPad charger when you are on the go, making it ideal for travelers and mobile workers.The DUB-H7 can be connected in cascade to provide additional USB 3.0 ports. Up to 5 hubs can be connected in daisy-chain configuration with a total number of 127 available ports.The DUB-H7 works with any USB device and is backward compatible with USB 1.0 standard. It is also compatible with OHCI (Open Host Controller Interface) and EHCI (Enhanced Host Controller Interface).The DUB-H7 works with any Windows, Mac or Linux system. Your computer will detect the USB hub and install the drivers automatically, so there is no need to carry the drivers on a CD or a memory dongle.